I like growing green beans. I like pickling them. I like sharing jars of pickled green beans with my homies. For that reason, I decided we needed a trellis. 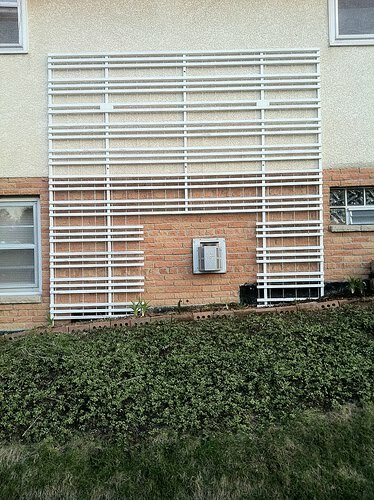 Not just ANY trellis...but an epic trellis. A trellis so big and so awesome that we could grow more than 75 square feet of beans. Enter my husband Gerg - the handiest, fixitiest dude I know. He was able to use salvaged wood from our epic fence project last year, hardware he had laying around, and paint leftover from the house trim. All he had to buy was a roll of twine for $2.97. The plan was simple. Build a giant trellis for the side of the house. 1) THINK BIG. 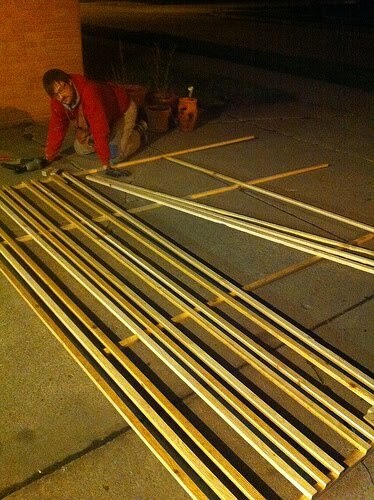 Lay out slats of wood. Nail them in place. Staple twine to the backside for additional crawl space for the vines. 2) Once assembled, paint it to match the trellis mounted to the front of your house. When you smack your head as you're painting the underside, don't cry. Instead, go in the garage, complain to Gerg, get a quick hug, and get back to painting. 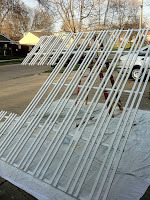 3) Hang it on the side of the house using very strong anchors reinforced with caulk. Then, stand back and marvel at your giant trellis. Sweet trellis! What kind of beans are you going to plant?